What constitutes effective front-yard landscaping? As you may well imagine, the answer depends, in part, on whom you ask. For example, while it's unlikely that a woodland garden would occupy the space in an urban or suburban setting, such front-yard landscaping is hardly unusual in rural areas. But if we limit the scope of the discussion to urban and suburban areas, we find consensus on ten steps homeowners can take to improve this most visible section of their properties. That term, "visible," however, immediately evokes a question: To what degree do you want your front-yard landscaping to invite public glances in, as opposed to screening them out to afford some privacy? Many strive for a balanced approach. You may wish to create a welcoming feeling here overall while erecting a small privacy screen to shelter a select pocket of the expanse from prying eyes. Don't worry: Properly thought out, a privacy screen will enhance, rather than detract from curb appeal. While fencing such as lattice can be used to construct a small privacy screen for a portion of your lawn, people more typically opt for a "living wall": a barrier composed of shrubs. Although some erect privacy fencing to screen out prying eyes from the street, not all fences are meant to furnish privacy. Fences sometimes serve mainly an aesthetic purpose: to define a property. Think of some of the post-and-rail fences you've seen: They provide neither privacy nor security; so what role do they play? Their function is visual definition. Borders play an important role, visually. A defined area catches the eye better than an open-ended one. To test this idea, go out for a drive, and make it a point to note which properties look more "finished." I can almost guarantee you that you'll find properties tastefully set off by hedges, fences or stone walls to be more attractive than those that aren’t. For more ideas for borders, please see this article on landscaping property lines. If you've chosen a hedge, fence or wall as a border, it will often be breached by a driveway. At the point of ingress -- at least on relatively upscale properties -- the driveway may be framed by a driveway gate. Whether or not you have a gate, be sure to pay attention to your driveway plantings, especially at the entrance. Remember, the first impression of your property that passersby form will be greatly impacted by the appearance of your driveway entrance. Many have a walkway that cuts across their lawn to their home's main entrance. Its layout will vary, according to its purpose. If its purpose is to lead visitors from the street to the door facing the street, then it should be straight. But if you'd rather have visitors enter via a side door or back door, there's no sense in encouraging a frontal assault by furnishing such a path; perhaps you, yourself hardly ever use your street-facing door. In that case, if your front-yard landscaping is to have any walkway at all, a better idea might be a winding flagstone walkway that invites you on a leisurely stroll through points of interest (Don't have any points of interest? Keep reading and we'll fix that!). Regardless of whether you encourage the use of your street-facing door as an entrance, you'll still want to make this area a focal point of your design. Plantings around the doorstep or porch can tie the area into the rest of your design, thereby promoting unity in your design. Sometimes, entryway plantings are part of a foundation bed. A Matter of Style: What's Your Taste? What design style do you prefer? This is one of the first decisions you'll have to make when planning a makeover. Some crave the clean, crisp look of a formal garden design. Those who are more laid-back prefer the exuberance of a cottage garden. Either way, you can profit from a quick introduction to basic garden design principles. Is Your Lawn Green Enough? If you've chosen to implement a formal style, then the lawn will probably play a critical part in your design. Then again, displaying a nice green lawn is a common goal that cuts across many different design tastes. There is a growing, vocal minority who are striving to eliminate -- or, at least, minimize -- lawns. They intentionally kill grass to make room for plant life that they find more interesting. Some employ xeriscaping techniques to conserve water as part of a green living approach. Even front-yard vegetable gardens are gaining in popularity. Edibles used to be strictly relegated to the backyard, but it's no longer one of the 7 Deadly Sins to allow them to be seen, given the proper design. But there are all kinds of more conventional points of interest you can install in your front-yard landscaping, including planting beds consisting of flowering shrubs and/or perennial flowers. Browse my flower pictures to find blooms of a particular color, or learn more about color schemes. Massed together, bedding plants can supplement the color offered by perennials and flowering shrubs. If you're designing for curb appeal, then trees will probably be one of your chief points of interest. But the term "trees" is deceiving in its simplicity, as it is applied to a group of plants ranging from giant shade trees to ornamental dwarf trees. 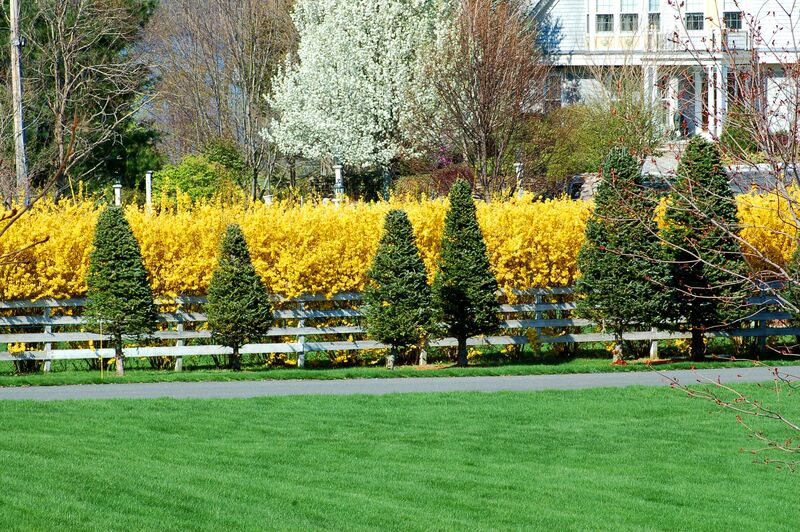 Weeping trees are a very popular group of specimen trees for front-yard landscaping in the U.S. Evergreen trees will be a suitable selection in some cases (e.g., for privacy); but if you want a big splash of spring color, some type of flowering tree will be a better choice. But points of interest needn't always consist of plant material. Hardscape can also form or be part of a focal point in your design. I'm particularly attracted to an arbor or pergola design used to support vines. When deployed with discretion, unusual yard art can make your front-yard landscaping pop. Sometimes, for a design to be effective, you must deal with problem areas in the yard or other challenges presented by a particular site. On my own site, e.g., I made a small, formerly unusable area under a large pine tree usable by installing a floating deck there. You ignore steep slopes only at your peril: Rather than a business-as-usual approach here, accept the challenge and tailor your design accordingly. If your home lies close to a highway, you may wish to erect a noise barrier to drown out the cacophony. In addition to such special cases, always decide on flower location based on sun, shade and other environmental factors. You must play the hand that you're dealt! Nobody ever said it would be easy! For inspiration, please see my landscape design photos. Do You Have to Live in a Cottage to Grow a Cottage Garden?